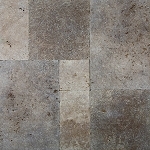 Tile-Stones.com has a rich stock of natural stone pavers that can be used for exterior installations. We offer a selection of pavers made from Travertine and Slate with multiple finishes including tumbled, brushed, chiseled edge and straight edge. Our Stone Pavers come in all shapes! We have sizes including 6x12, 8x8, 8x16, 12x24 and 24x24. We also carry Stone Pavers in Versailles pattern; the perfect pattern for adding a timeless touch to any build. Whether you are looking to use stone pavers in your garden, driveway or using them to forge a natural looking pathway throughout your property, Tile-Stones.com is sure to have the perfect paver you need.